So what can you do if you don't want your personal Google+ Profile name associated with your blog? How can you blog pseudonymously or anonymously? 2. Add your Google+ Page as a blog author and write posts as your Page. (Note: this is only possible if you have an old Google+ Page with a password set). Authoring posts as your Google+ Page lets you keep your pseudonymity while using Blogger's Google+ features. Note: with the update of the Blogger interface in November 2016, the instructions below are out of date. You can find this setting under your Blogger Settings > User Settings. If your blog is connected to Google+, your Google+ Profile is automatically the author of each post. You can make your name less prominent by removing the "Author" field from the Blog Post gadget in your blog's Layout. However even though your author name may not be as visible on your blog, it may still appear in other places, such as your blog's post feed. And your name and Google+ Profile may be linked to any comments you make. 2. Click the gear icon. You can select the "Revert to a Blogger profile" option from the menu. The down side of reverting to a Blogger profile is that you will no longer be able to use Google+ features such as Google+ comments, mentioning people in your circles and automatically sharing to Google+. To retain all the Google+ features on your blog, but post using something other than your "common name" you can instead add your Google+ Page as an author of your blog. Note: as of September 2016, Google no longer offers the option to set a password for a Google+ Page. You can check to see if you older Page and its Brand Account has a password set by opening your Brand Account list (myaccount.google.com/brandaccounts), and clicking the Brand Account name. If you see an Update Password button, there is a password set. If you don't see that button, that is not an option. To use Google+ features on Blogger without using your Google+ Profile as your author identity, you need to add a Google+ Page for your blog as an author. Blogger lets you add an author to your blog by adding the author's Google account email address - the trick, then, is doing that for your Google+ Page's Google account. 2. Create a password for your Google+ Page. 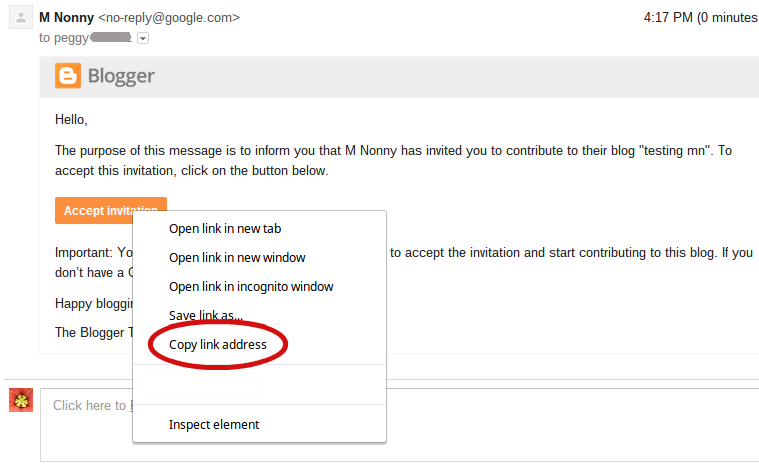 Look for the email author invitation from Blogger in the email account set to receive your Google+ Page notifications. The invitation will have a big orange "Accept invitation" button - don't click this button! Instead, copy the button link. If you are using Chrome you can alt-click the button and select copy link address. 5. Now open a new browser and sign into Google or Blogger (www.blogger.com) with your Google+ Page's username and password. Once you are signed in as your Google+ Page, paste the "Accept invitation" URL into the browser's address bar. You should see your Google+ Page's profile photo and name in the upper right corner and a big orange "Accept Invitation" button. Now you can click the orange button. 6. Now you can sign into Blogger as your Google+ Page and post using your Page identity. 7. Optional: Sign in to Blogger using your original Google account, go to your Settings and promote your Google+ Page from "Author" to "Admin". As an Admin you will be able to change your blog's Layout, see your Stats and more. Once you've got it set up it's easy. I'm posting as a Google+ Page right now! Perfect! This is exactly what I was looking for. Very good post and I'm looking for this trick. thank you! Name Surname: did you set a password for your Google+ Page? And are you sure you entered the correct username? If so, did you use the default @pages.plusgoogle.com username, or did you add a gmail email? the same thing is happening for me as well @name surname but i fixed it by trying to log into gmail online with the @pages.plusgoogle.com provided and then it gave me a page to make my own email and use @pages.plusgoogle.com as an alternative. When i finished and made an email that my way and not gibberish. I went back to blogger and sent an invite to the new email and again went to the direct gmail account i newly created and bam the email was there and i accepted with the page info and not the profile. PS- it helps to use 2 browsers . chrome and safari or whatever they may be so you can keep both accounts open not having to log in and out a billion times. Also thanks so much Peggy K your the only site who explains this well. I was searching for ages. Sometimes google just makes you go in circles. Is switching to Google+ comments worth it? I have read some posts about people getting fewer comments after switching to Google+ comments. I think it depends on whether your audience is mostly on Google+ or not. You don't want to prevent people from commenting just because they don't have a Google+ Profile - that's why I'm using Blogger comments here. then it appears to currently be using a Google+ Profile, so maybe you fixed it? I am sorry. I must be a dummy. I don't get it. All I want to do is to be able to share my blog posts to a separate second Google+ page, not my original page. It seems like they should have a drop down or something that gives you the option of which Google+ page you are sharing to. I just can't figure out how to do it. Maybe the information you are providing here isn't meant for what I am trying to do. Hi Nancy, no you're not a dummy - it's not intuitive at all. There isn't any way to select which Google+ identity to share to when you click the +1 button. And when you set up your blog, you are only able to associate one Page or Profile for automatic sharing. I find that sometimes the easiest thing to do is just share the link to Google+ manually, by pasting the link into a new post. Thank you, Thank you, Thank you! I have been having serious privacy concerns about switching to google+ since my google account IS my name - and my blog talks about something completely different than my 'common' or 'personal' google plus page! I love this work around to separate them.